If you’ve ever heard the term “rocky head” associated with a beer, Orval Trappist Ale is the very definition of that term. It looks substantial enough to send an expeditionary force up to conquer it. The monks also make a loaf-shaped cheese that I would love to try with an Orval. Pale and caramel malts, liquid candi sugar and a proprietary Orval yeast go into making this complex beauty. It is dry-hopped and then bottle-conditioned with Brett. The result is a hazy, orangeish beer with the aforementioned rocky head. The aroma reminds me of a malthouse, and the taste is a lovely mix of dryness and just a hint of sourness from the Brett. Among the other complexities, I find a taste of black pepper that pleasantly lingers. This is a brew that lends itself to aging; however, I’ve not aged any myself. One day. I would love to know where it goes with age. 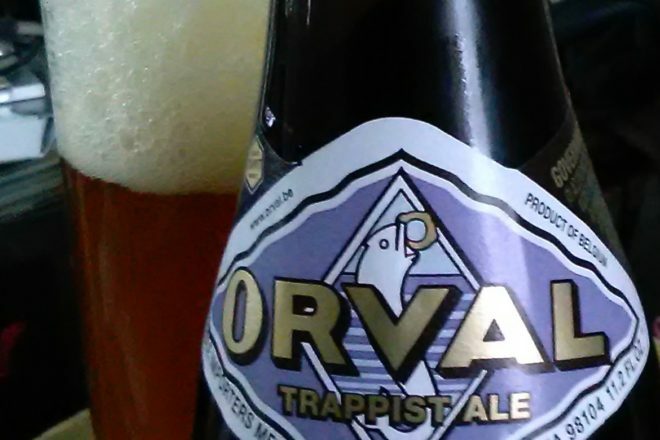 March 23 is designated Orval Day. For every bottle sold at specific locations, 50 cents is donated to a charity. This year the charity is the Safe Water Network, which provides safe, sustainable water to people in India and Ghana. Looking at the list of locations where Orval Day will be celebrated in the U.S., I see that Minnesota does not have a single listing for participation, and only the Malt House in Madison is named in Wisconsin. Importer Merchant du Vin has a list of participating locations at merchantduvin.com/orvalday.php. There is a story behind the logo of a trout standing on its tail with a ring in its mouth, but you can also read about that at the link above.